When Pam & Tony Britton retired after 40 years working together they expected to enjoy a long retirement. Instead Pam was diagnosed with Alzheimer’s disease and after a rapid illness passed away in 2013. Finding little support whilst he cared for her, husband Tony set up “The Pam Britton Trust for Dementia” in 2014. Tony recently told the Rotary Club of Warwick about his focus to provide “a caring hand” and resources to help people in South Warwickshire cope with this diagnosis. One in four people over 65 will develop a form of dementia, and 50% of those over 80 will have memory loss and find it difficult to live alone. By 2050 numbers will have trebled, and society’s response needs to be upgraded to ensure people can continue to live in the community, and their carers are supported. Working initially with Age UK Warwickshire, a Carer Navigator service was set up to provide support, practical advice and information to people with dementia, their families and carers. Following this Tony has assisted in setting up four support groups, in Lillington, Chase Meadow, Brunswick and Harbury. Local Dementia support groups have been established so that people can meet regularly to join in activities, enjoy music and remain part of their community. The Trust has liaised with Warwickshire County Council and CAVA – Council for Voluntary Agencies, to form a local network of support groups and produce a Booklet of Support Resources which has now been updated and reprinted four times! The Trust has joined the Dementia Action Alliance which published the Dementia Friendly Hospitals protocol and he continues to raise the profile of this “hidden disease” which claims as many lives as stroke and cancer combined. 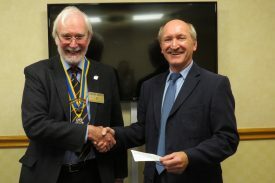 After Rotarian Margaret Morley had thanked Tony for “making a difference” for those affected in Warwick district, President David Smith presented Tony with a cheque towards his work.